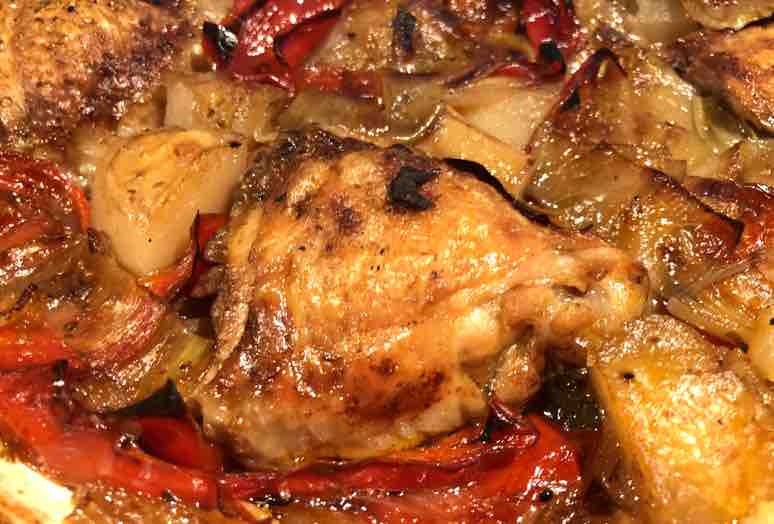 A simple delicious Spanish style chicken thigh recipe costing only pennies per person to produce. Easy to prepare ideally in a flat casserole dish to help crisp up the chicken thigh skin towards the end of the cooking time. 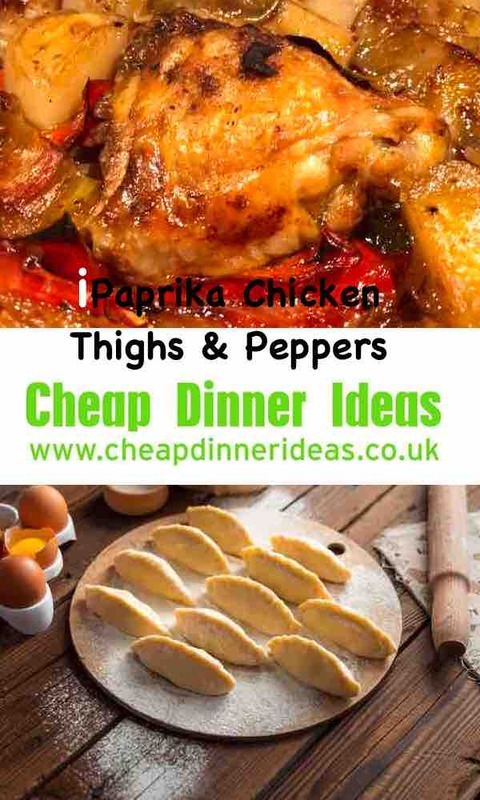 This was created on a lazy Saturday afternoon not quite sure what we wanted to eat on our Saturday night in.Indulge in Cheap slow paprika chicken thighs. Chicken thighs are the perfect answer to a cheap dinner idea for a crowd. I picked up five chicken thighs for around £1.80 what value for money especially if your cooking on a budget. They are so versatile, have so much more flavour than a chicken breast because of the fat content. All you need to do is add a few spuds and you have a meal, paired with wonky veg then you have a fantastic budget meal. 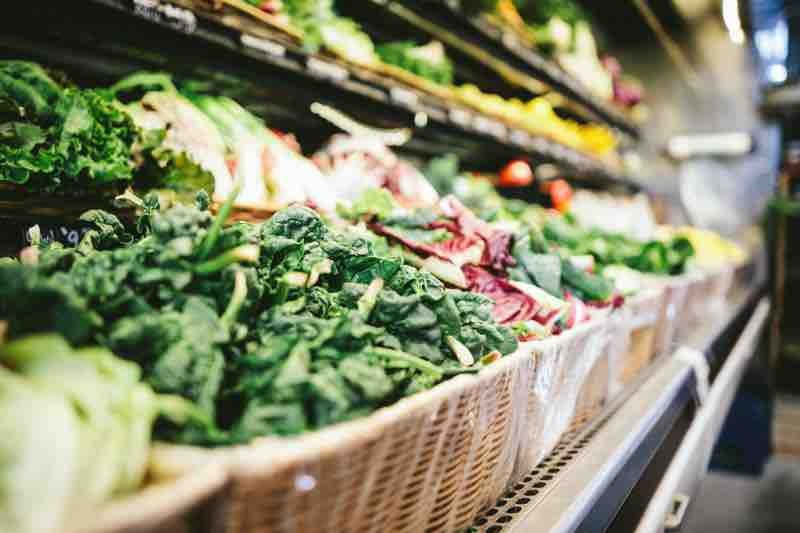 Everyone should be choosing wonky veg, it cuts down on food waste and when its cooked it tastes the same. Unless you are doing five star dining then it does not matter, if you have been trained to that level then still you should be able to present the dish perfectly. I used my old trusted cast iron flat casserole dish which I bought from Sainsbury’s whilst on offer. 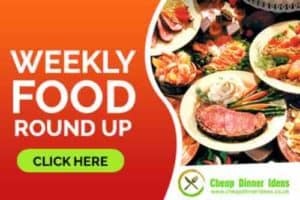 Sainsbury’s often reduce the price of their cook ware so wait patiently as there will be a great offer on. Cast iron cookware last a life time if cared for correctly. The naked cast iron takes a little effort to look after but if you get the enamelled cast iron then it is so much easier. 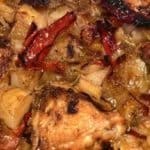 Chicken thighs can be cooked in the oven in as little as twenty to thirty minutes, However they will benefit from a long slow cook in the oven. be careful not to cook them to long especially if you do not have any liquid in the casserole dish as they will become dry. Maximum cooking time should be three hours for chicken thighs. 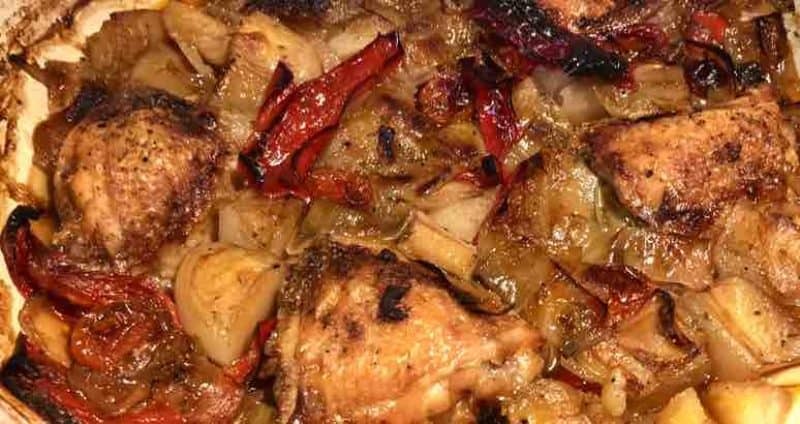 Chicken thighs minimum cooking time 30 minutes, maximum 3 hours. I decided that I wanted my paprika chicken thighs to be some somewhat crispy when served. As this was a lazy dinner I did not debone them to start with., especially as it was a long slow cook the meat would fall of anyway. Firstly I cooked them in the cast-iron dish with a little olive oil and butter. Seasoned both sides of course, cook until the skin has started to go a light brown colour. I then added the smoked paprika chopped onions and peppers. Ensure that all the ingredients get covered in the smoked paprika. After cooking for five minutes I then added the potatoes and garlic cook for 2 minutes. 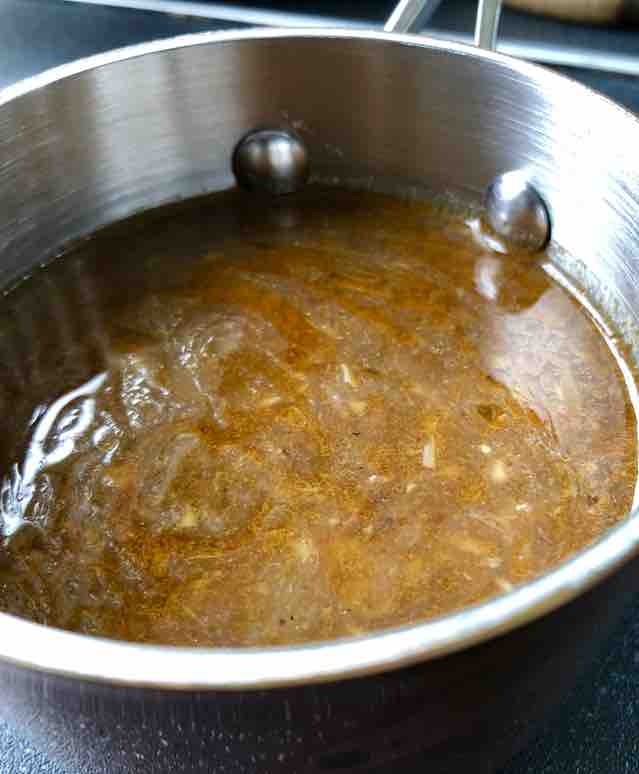 Then add the chicken stock and white vine vinegar. 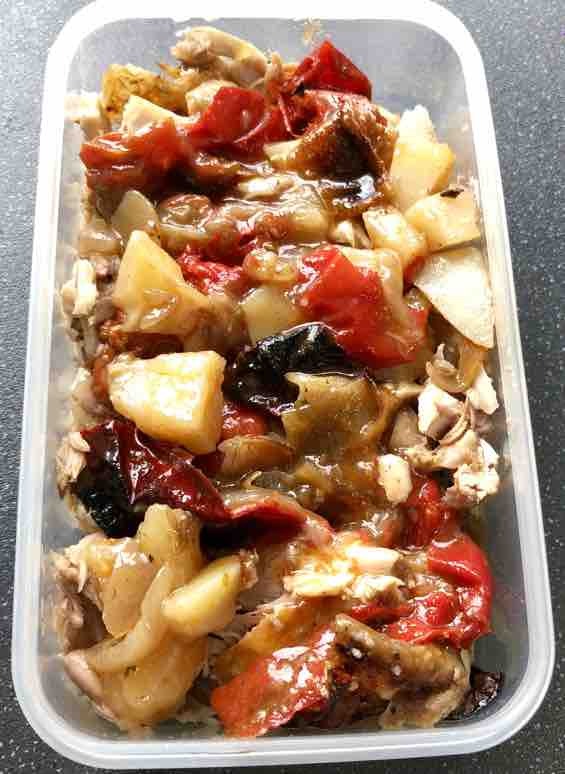 A last moment addition to my Cheap Slow Paprika Chicken Thighs Pepper Potatoes was my ready chopped frozen leek. Place in the oven and leave for 2 hours. Its a simple as that. Now add your potatoes, season and stir to coat everything. Now turn all your chicken thighs up so they will crips up during cooking. Now add the stock, white wine vinegar and oregano. Only add the stock so it comes 3/4 way up the chicken thighs. If you prefer your potatoes to have a little more density rather than just falling apart you can either use more waxy potatoes or add the potatoes half way through cooking in the oven. The dish was super quick to make and I even made a pigs cheek dish at the same time. First of all I placed the chicken thighs in the cast-iron flat casserole dish to start to brown. Whilst that was happening I cut my onions and peppers, peeled the potatoes and roughly chopped all the garlic. I must confess that the stock was from a cube so it was a simple task of pressing the on button on the kettle. So for a little over Three pounds this dish would easily feed four people, add some Spanish bread and it would easily feed five people. The leftover stock what was left had some small soft chunks of garlic and little pieces onions. These were all very soft so I mashed them with a fork until the sauce/stock was pretty some. You could transfer to a blender if you wished but it was simple enough with a fork as everything was super soft. 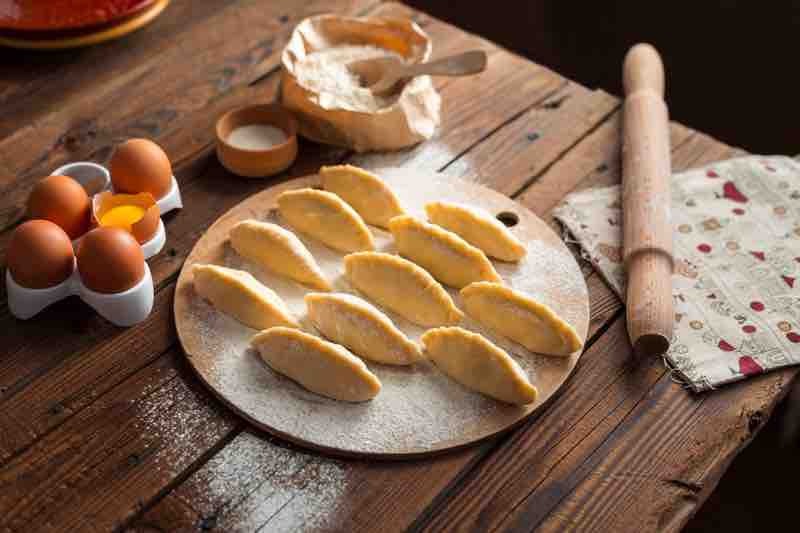 I am going to make some Empinda’s with the leftover chicken. The stock will be reduced to intensify the flavours. Perfect as it also makes the original dish even cheaper. I often cut up extra vegetables whilst preparing dishes. I cut up the rest of the sweet peppers whilst preparing the cheap slow paprika chicken thighs. All chopped up and into the freezer they went ready for the next meal. I do the same with carrots chopping them into different sizes for different dishes. Julienne, simple chopped as the kids like them and some chunky bits for roasting. Leeks as they usually come in bags of threes and I only use one I chopped them and stick them in the freezer. 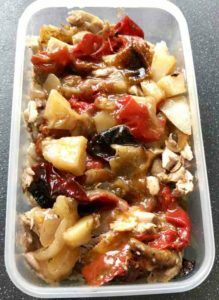 Stop food waste cut up the veg you know you won’t use in the week and freeze them.